It has been great fun to dust off my laptop and work out some kinks in my Max patch over the past few weeks, all in readiness for a a now quite rare improvisation for digitally augmented voice at Iklectik in London. This is part of of their really fab sounding </CODING in GE> festival which also has a range of workshops on offer. Find the details here. 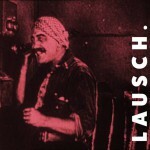 I have finally managed to upload a documentary from the performance of Lauschen earlier this year. Thankfully just in time for performing the piece at An acquisition of sorts in Oxford – more info is here. 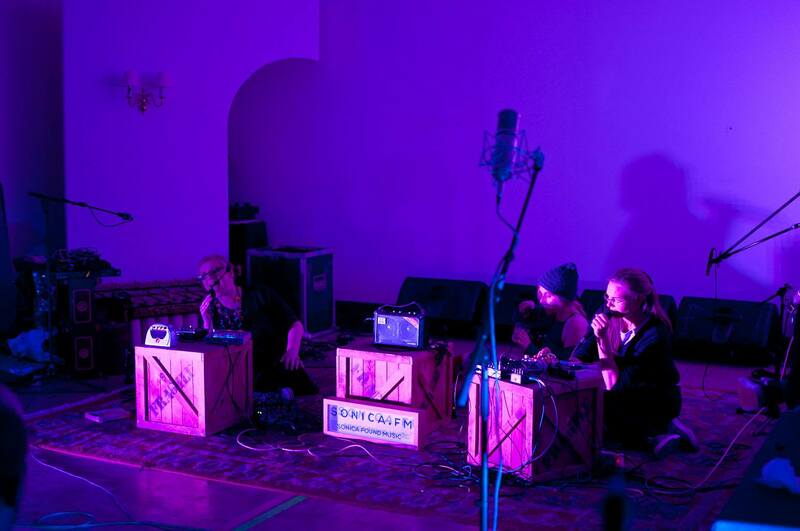 Performing as part of Laura Denning‘s Hydrosapien (at the Atlantic Project, Plymouth Guildhall), including creating very satisfying voicings with Joseph Kohlmaier last month was quite an experience and I hope there will be another opportunity at some before too long. 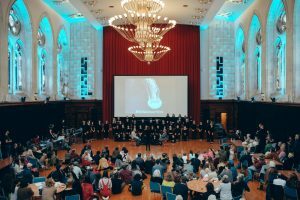 A film was made about the entire project, which I am looking forward to as it contains more information about the process of the Silent Choir. This month I will appeared with Jude Cowan Montague at Zero Wave #23 in London; we’ve decided to call it a Dr Dr and wear some white lab coats. It was a bit weird. I am very much looking forward to performing with the brilliant Joseph Kohlmaier as part of the equally brilliant Laura Denning‘s piece Hydrosapien. 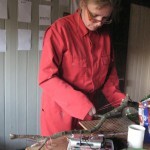 It is inspired by AstridaNeimanis’ notion of hydrofeminism and premiers at Plymouth Arts Weekender later this month. At rehearsals we boiled it down to just voice and a microphone, just sounds amazing. 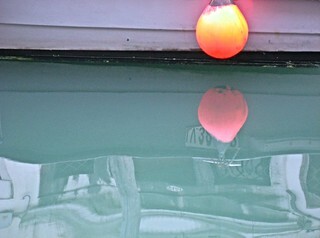 Some pictures are below and more details are at http://hydrosapien.weebly.com. Also that weekend, you can find a text score of mine entitled “Score for Contraceptives“as part of Tomoko Hojo‘s Unfinished Descriptions at Hundred Years Gallery, London. The show is based on Yoko Ono’s historical exhibition ‘Unfinished Objects and Paintings’ at the Indica Gallery in 1966, and re-imagines/re-creates works which were not documented in the catalogue. A few new dates have come in. I will be playing a duo with Jude Cowan Montague at Zero Wave, from 7.30 at 25th October. We haven’t played together for a while, so I am really looking forward to this! On 15th November I’ll be doing a now rather rare digital voice set at Iklectik; I haven’t got any further dates as yet but will post as I get them. Also in November is another performance of LAUSCHEN this time at the superbly titled An acquisition of sorts, in Oxford – thanks to Lee Riley for the invite! More info is here. In the meantime, below are some photos from Lauschen at Bath in July, a video will follow before too long (i hope…). 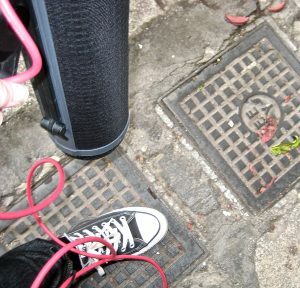 A video extract from my performance at the event “Found Objects : Found Sound”, the audible part of “Fountain 17”. It took place at Salon Des Refuses 2018 and is based on a telephone book by the way of found object – I had discovered on my doorstep in the morning so it seemed a good choice. More documentation to come soon. Between 7 -10 June, my participatory project Fountain 17 is at Salon des Refusés 2018, at Candid Arts Trust, 3-5 Torrens Street, Islington, London EC1V 1NQ. Thanks to all the artists who contributed images (list is here)! 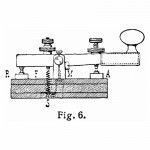 On 10 June I am also curating an afternoon of “found objects / found sounds“ there to accompany the Duchamp inspired work. Amongst others there will be performances by Douglas Benford, David Bloor and myself. You can find the full details here. I am also looking forward to a trip to Bath! Between 6-8pm on 9 June I am performing Lauschen at It Sounds Devicive in the gorgeous Walcot Chapel, Walcot Gate, Bath BA1 5UG. Also performing will be the wonderful Martin Vishnick and the whole thing has been put together by Lee Riley as part of Fringe Arts Bath Festival. Next month I’ll have the good fortune to be part of two fabulous Linear Obsessional events which are part of the mini festival. 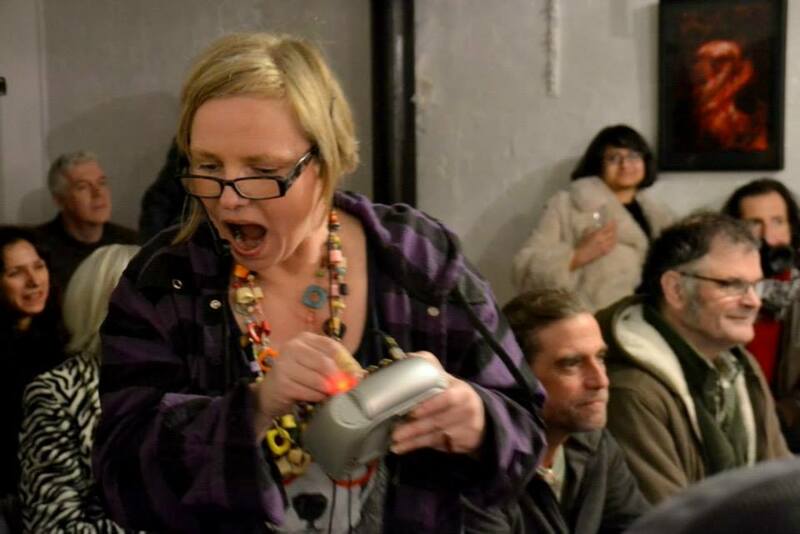 Number one is one of the regular ArtsCafe afternoons on 13 May, where I’ll perform two pieces with Ingrid Plum, one of which is a voice extract from John Cage’s 4’33 (yeah, we thought that was funny too…). 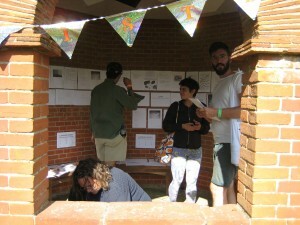 The other event is Time Dilation on 20 May 12noon-3pm at Manor Park, Lewisham. It’s a full 3 hour durational improvisation curated by Richard Sanderson. Imagine a plethora of amazing improvisors roaming around, literally droning on for hours. Heaven. More about the event is here. 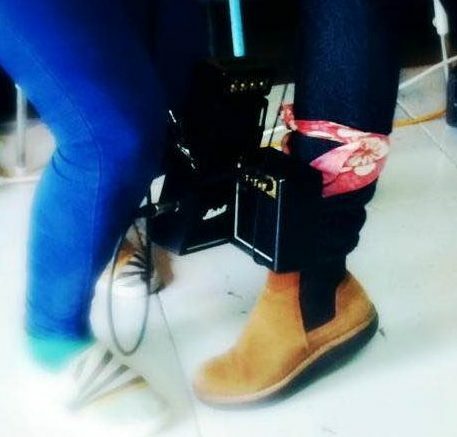 At the beginning of the month, 4 – 11 May, you can also catch the show of my scarily imaginative LCC 2nd year sound installation students at Gallery 46 in Whitechapel. More info is here. I am delighted! On 25 March I shall be giving an all-day workshop “Exploring site-specificity through sound” at APT Gallery, Deptford, London. This event is in conjunction with the exhibition “[city]Frequency“ by Maike Zimmermann, a very lovely audio-visual work in which you can see some surprising similarities between New York and Deptford. Who would have guessed! I have also contributed a short text “Sound in Place” to the exhibition catalogue. More details about the workshop and the booking link are here. In April I will travel to Belfast for Sonorities Festival 2018, which has the fabulous subtitle, “you might not like it”… Between 18-22 April the Listening Wall will be installed at QSS Gallery, in the city centre. On 21 April I will also give a paper about the project, called “The Listening Wall: A journey into scored listening” at Sonorities Symposium 2018: Techno–Human Encounters, SARC, Belfast. Hope to see some of you there! Between 2-18 February a VR app containing a series of audio-visual pieces I created as part of the Soundscapes Landscapes (City Above Life Below) residency at Onassis Centre, Athens will be on show there. Do check them out if you’re in the area! I am very sad that I won’t be able to go and get the full VR experience myself! A bit later in the month, on 28 February, Ingrid Plum will be performing a score that I created for her, called the “the modular vocalist”, at Rose Hill Brighton, Rose Hill Terrace, Brighton, Click here for more info. 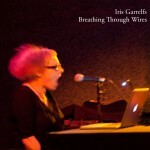 It is part of her amazing Taut project that you might want to check out if you’re into voice related things. This is that, at its best! On 9 March I am heading over to London College of Communication, where I will be on the CRiSAP Research Game Show. It sounds like huge fun, and will also explore some serious issues around methodologies for practice based research. All taking place at LCC, Lecture Theatre B, Elephant & Castle London, London SE1 6SB. Free entry, 5pm to 7pm. More details are here. 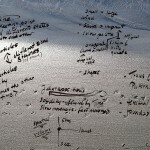 An annotated transcript will be available at the end of the year in Reflections on Process in Sound. 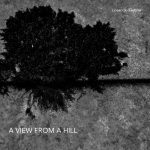 Before the year draws to a close, there is a bunch (105 to be exact) of marvellous free recording on the way, one of which is mine unsurprisingly… It’s called Iris’ View and is a humorous take on the title of the album, A View from the Hill. The whole thing is available from the most delightful Linear Obsessional label, on 24th December. Click here to download it. And so, HAPPY NEW YEAR! I am delighted that a peri-urban exploration I undertook a while back with Postcards from the Volcano, aka Helen Frosi and Stephan Barrett, finds another airing. This takes place on 6th November at 7pm on Glasgow’s radio art fab project Radiophrenia. Between 27 November and 2nd December, I will also play some live dates in Mexico City and Guadalajara, the details of which are to be found here. 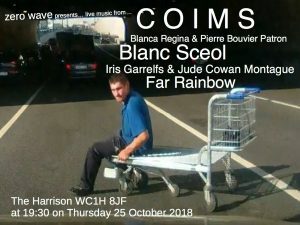 But before heading of, on 25th November I am playing a trio with Zoe Gilmore and Iona Tangy (who some of you might know as a member of Amsterdam-based electronic art punk band Minny Pops), in memory of fellow musician Lyndsey Cockwell who sadly passed away earlier this year. Find all the info here. On 15 December I will play an x-mas inflected Duo with Richard Sanderson at Scaledown, at The King and Queen, 1 Foley Street, London, W1W 6DL, 8pm. We’ve decided to call ourselves the Intergalactic Exchange Students. Total(ly) (mis)fits. Another very lovely review has come my way – see the one from last month’s NoizeMaschin! !#15 here, seriously blush-inducing material! Finally, I will have a chance to play live again, thanks to NoizeMaschin! !#15 on 3rd October, 7.30 PM at the Amersham Arms, London. The format of the night is very unique, with overlapping sets, so do check out the details here. 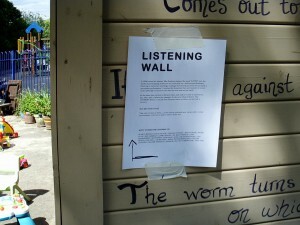 I am very exited to say that between 4th and 6th August you can experience an extended version of the Listening Wall at Supernormal Festival, Braziers Park, Oxfordshire. It’s all the better because I will be there in person for the duration, performing with the Bermuda Triangle Test Transmission in the BEEF Octopolis shed at 9pm on the 5th August. Looking a little ahead, on 11th September my Transmedia Border pieces will be in evidence at the Expanded poetry and Multimedia Arts Conference at the Universidad del Claustro de Sor Juana, Sala de cine, José María Izazaga 92, Centro, CDMX, México. Details are here. 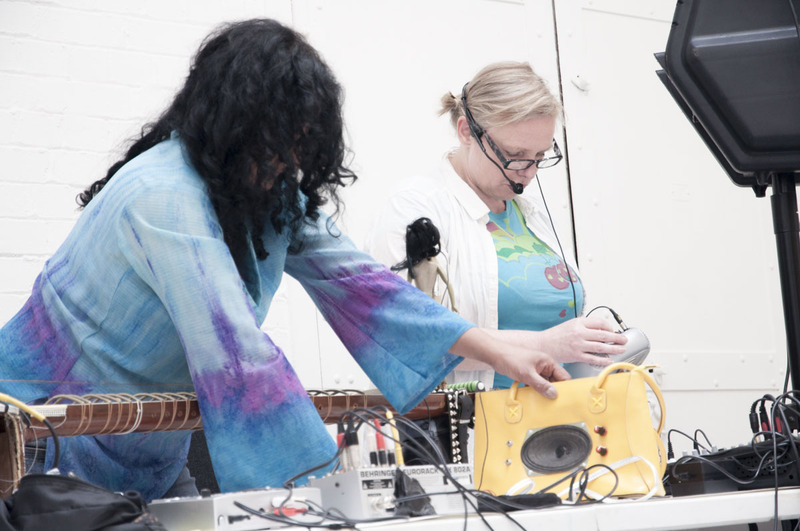 On 4th July I have been invited to give a talk and participate in a panel at Political Aesthetics in Sound Art: Gender & Feminism as part of Sonic Waterloo. The panel is hosted by the Wire’s deputy editor Emily Bick; also participating will be Cathy Lane. 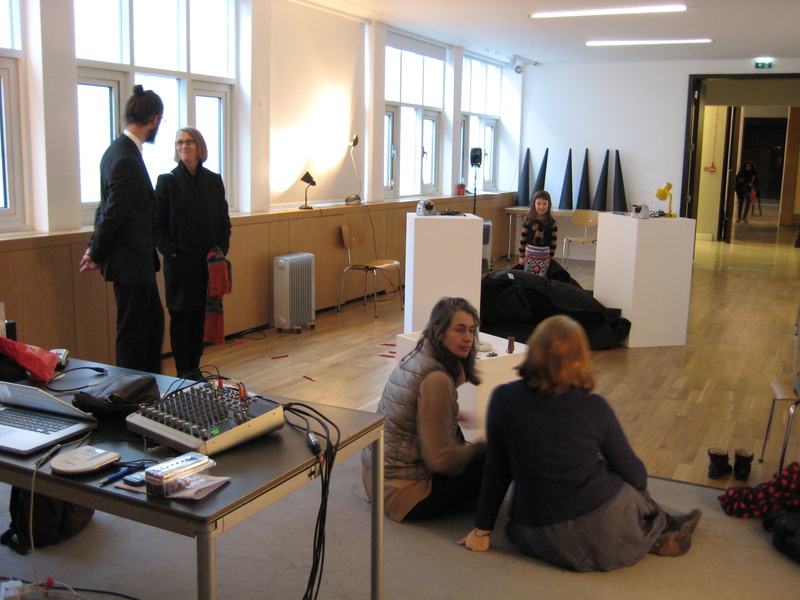 It all takes place at Iklectik, London, 6-8pm. Details are here. I am very much looking forward to performing a duo with Richard Sanderson at Linear Obsessional Live on 15th July at Vinyl Deptford, 4 Tanners Hill, London SE8 4PJ London. Needless to say there will be plenty more amazingly good music on offer, amongst them raxil4 and Chris Prosser with James O’Sullivan. More details are here. 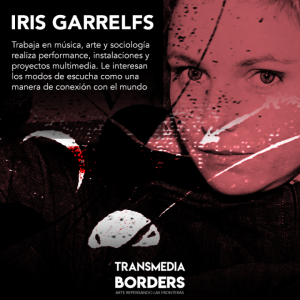 Earlier this year I was invited to participate in Transmedia Borders, a project based in Mexico exploring the very timely subjects of immigration, displacement, language, visual and sound friction. It is curated by the poet Rocío Cerón and also features the wonderful Aki Onda and Abraham Chavelas, with the first event taking place on 27 July at 17th Feria del Libro Infantil y Juvenil Hidalgo. 8pm, Centro Cultural del Ferrocarril, General Ignacio Mejía S/N, Col. Morelos, Pachuca de Soto Hidalgo, Mexico. Details are here. 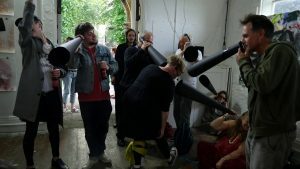 On 21st June, the first ever Longplayer Day, a 12-hour peripatetic cross-disciplinary festival at various venues between Goldsmiths University and London’d Trinity Buoy Wharf is set to take place. Longplayer Day is inspired by Jem Finer’s 1000-year long composition of the same name – the philosophy, interests and aims behind it. 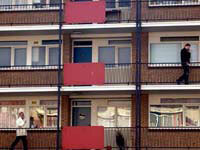 I am totally delighted to be the Goldsmiths academic lead on this project! 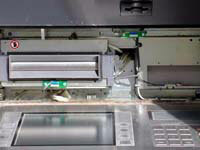 Find all programme details, and subsequent documentation here. 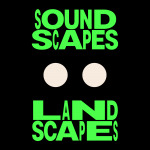 28th June sees the launch of a mobile phone app containing pieces I created as part of the Soundscapes Landscapes (City Above Life Below) residency at the Onassis Cultural Centre in Athens, Greece last autumn. 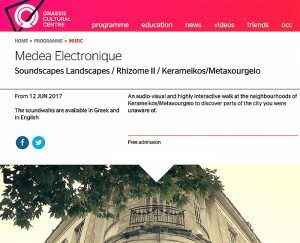 The project is curated by Medea Electronique and effectively constitutes an interactive audio-visual walk through the neighbourhoods of Kerameikos and Metaxourgeio. A virtual reality version will be released early next year. Next Month is set to be a busy one. 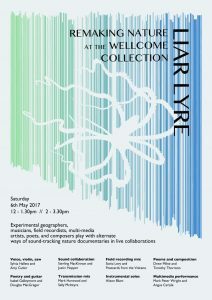 On 6th May, in collaboration with Douglas Benford, I will be live-scoring a section of the apocalyptically prophetic documentary exploring post-human insect survivals, “The Hellstrom Chronicle” (which, incidentally inspired the sci fi novel Hellstrom’s Hive) as part of Liar Lyre – Remarking Nature, Welcome Collection, London. Programmes at 12noon and 2.30pm. Ten days later, on 16th May I will be travelling to Plymouth, to give a keynote The Multidimensionality of Objects at the super interesting symposium Multisensory Aesthetics, a transdisciplinary collaboration between psychology, fine art, 3D design and sound art to explore the creation and perception of multisensory artworks, University of Plymouth. All curated an put together by the fab Mike Blow! On the very same day, the equally fab Ingrid Plum is set to perform one of my scores – “The Modular Vocalist” – written specifically with her formidable capabilities in mind. All taking place at Cinema Expanded – the Sensual Nature of Sound at the De La Warr Pavilion, Bexhill, East Sussex. More details are here. 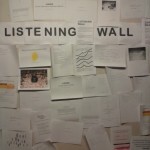 On 21st May, the Listening Wall will pop up at the Linear Obsessional Festival, ArtsCafe, Manor Park, London SE13 5QZ. I hope you can join us for a day of experimental sound! 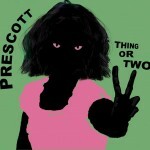 I have just received the new Prescott album Thing or Two in the post, on account of me having contributed a few seconds of vocal madness to one of the tracks. It is lovely to have a real CD in my hand again, and this one is so worth buying when it is released on 1st May! For International Women’s Day on 8th March, Jude Montague Cowan and myself will released a film around the London anti-Trump women’s march on 21st January of this year. 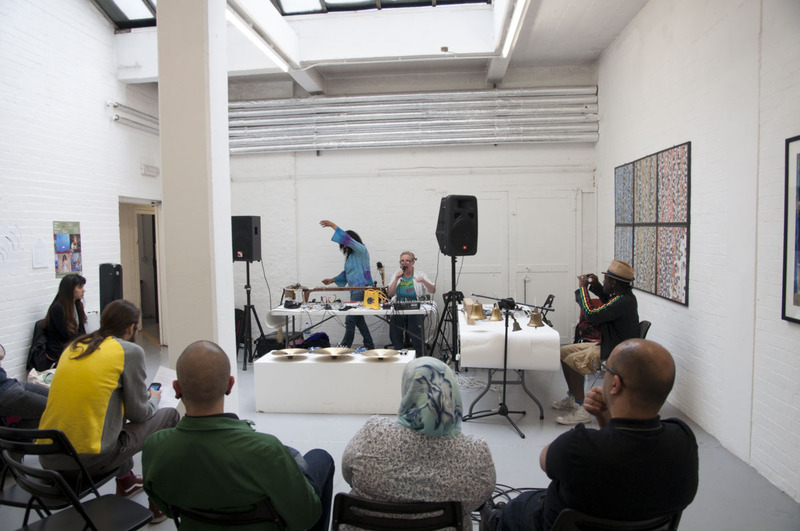 The sound was created live on Resonance FM, using tweets and material from other media outlets whilst the images are photographs taken on the March. Find the film here. I am also hugely looking forward to my research trip to Beijing later this month to explore a project around Beijing Opera and contemporary vocal performance. I have never been before so doubtlessly I shall be doing all those delightfully tacky touristy things such as visiting the Forbidden City! On 28th March, 9pm I shall be performing at fRUITYSPACE at 13 Meishuguan Dongjie, Dongcheng, Beijing, run by the lovely people of the fRUITYSHOP shop record shop, which I shall doubtlessly spend some time in! I’d be up for other performances/workshops/talks too so do get in touch for anything that is happening between 25/3 and 9/4. January is shaping up to be a surprisingly busy month. I have just started as a Senior Lecturer in Sonic Art at Goldsmiths, University of London and feeling very stimulated by my new fab colleagues and students. I wish there were more hours in the day to chat and exchange ideas! As it is, on 10th January I will be giving a talk about my recent work entitled Sounding ceramic sculptures at the Music Research Series at Goldsmiths. On 21 January (from 2.30pm) I will appear on The News Agent, on Resonance FM, talking with Jude Cowan Montague about process, and, more importantly, improvising with tweets and such like in response to the anti-Trump women’s march in London. Later that week, on 29th January, my “installation” of sorts Listening Wall, featuring a collection of listening scores contributed by fellow artists, will open as part of the Chinese Open, in a multi-story car park in London’s China Town. The exhibition continues until 5th February. Find the details here. November has been a very busy month! I very much loved being in Athens for the Soundscapes Landscapes (City Above Life Below) residency, working on a range of pieces celebrating the notion of a “Bifurcation of Time”. A small taster can be found below, the final project with be launched in early summer 2017 at the Onassis Cultural Centre, Athens, Greece. Christmas Eve will see the release of Faulty Retrieval, a compilation track for the Linear Obsessional compilation Utterances, amongst 111 (yes, you read correctly…) other fabulous artists and their works. It celebrates my lacking ability to remember any lyrics correctly and a budding personal nostalgia for the CD format. I am delighted to say that I have been awarded the Sound and Music Francis Chagrin Award, which will go towards purchasing some recoding equipment. It’s very timely as I will be able to use it during my upcoming Soundscapes Landscapes (City Above Life Below) residency in Athens (Greece). The projects brings together a group of international artists to work on a joint project to be exhibited at the Onassis Cultural Center in Athens. You’ll be able to follow what’s happening on my residency blog. Very exciting news is another development, I am starting a new label with Jude Cowan Montague. It’s called Hardy Cuttings and is dedicated to nurturing sounds from avant-pop to post-dada. Lastly, below a documentary covering my performance Eclipse and other offerings from Switched On at the Beaney Art Museum in Canterbury (UK) earlier this year. 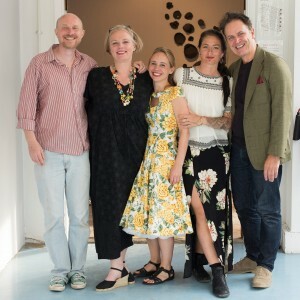 Littoral Assembly, the ceramics and sound installation developed with Icelandic artist Ingibjörg Gudmundsdottir for the Brighton Digital Festival has opened at the Phoenix Brighton and will continue till the 25th. 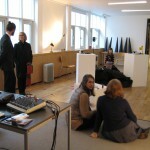 You can read an interview with one of the curators, Joseph Young, at http://www.attnmagazine.co.uk/features/10411. It has been an absolutely wonderful experience all the way through so no wonder that the image shows everyone looking relaxed and smiling! 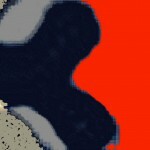 I am thinking of re-working the material into an album with a provisional title of Brighton Variations. My Landscape : Islands residency has gone off to a good start with traveling down to Brighton, meeting everyone involved and comparing ideas. We will give a public talk about our ideas and experiences at the Spotlight event on 30th August and our installation opens at the Brighton Digital Festival on 1st September. 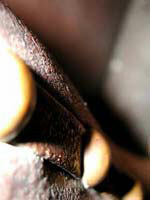 In the meantime I’ll be posting regular updates on my blog. On 4th September, 4-7pm I am playing with Jude Cowan Montague at the delightful Manor Park Arts Cafe in Lewisham (London SE13 5QZ) again. It’s a fab Linear Obsessional event and hence reliably quirky. Also playing will be Viv Corringham and we might end the day with a trio if the mood takes us. In any case, I hope the weather will hold and we can play outside! A few days later -10th September to be precise – I’ll be decamping to Margate, playing at Electromatronic alongside CSMA and the Athelstan Sound Ensemble. The venue we’re playing at – the Tom Thumb Theatre – is one of the smallest theatres in the world, originally built as a Victorian coach house. Should be intriguing! Find all the details at https://www.facebook.com. From 1st to 8th November I will be artist in residence at Soundscapes Landscapes, City Above Life Below, produced by Medea Electronique at the Onassis Cultural Centre in Athens, Greece. There will be some public activity around the residency which I will post about at a later date. Lastly, my paper “Listening lives: how some sound artists understand inputs to their practice” has been excepted to Sonologia in Sao Paulo. Now I just have to find the money to get there! After a little summer break, I am springing back into action. First up, on 11th July I will be giving a paper Traces in/of/with Sound: an artist’s experience of audio-visual space at Sonic Environments/NIME in Brisbane. Sadly I can’t be there in person but will be delivering the paper via skype at 4.30am in the morning. That’ll be an early night then. Find the proceedings here. 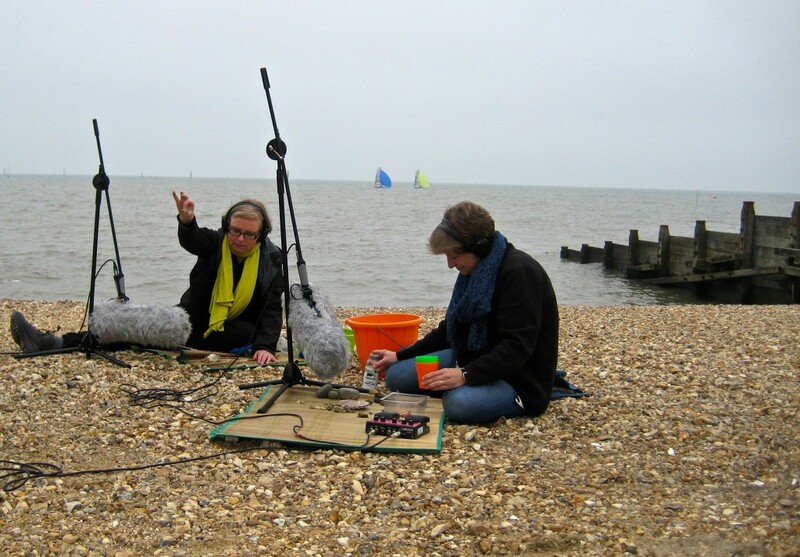 After our Lab of Sonic Possibilities performance for beach and microphones at the Whitstable Biennale’s Silent programme, I am very much looking forward to our next outing, this time with a performance for angle lamps. It will take place on 28th July, 3-5pm. at V22 Louise House in Forrest Hill, 3-5pm. You can see pictures from Whitstable here. In August, I will be busy with my Landscape : Islands residency – a collaboration with Icelandic ceramics artist Ingibjörg Gudmundsdottir. The installation we are creating will open on 1st September at the Phoenix Brighton. You can follow our progress on my blog. There will be some talks around it which I will post about later. I am currently in the process of preparing a new audio-visual performance piece called Otzi for the MuseRuole Festival, to take place at the Museion Museum for Modern and Contemporary Art in Bolzano/Italy, on 27th May 2016, curated by Valeria Merlini, aka JD Zazie. The piece loosely inspired by the story of the Ötzi the ieceman, an extremely well-preserved natural mummy who was found buried in ice in the nearby Ötztal Alps (hence the name). His body and belongings are now on display in the South Tyrol Museum of Archaeology, just down the road from the festival venue. Later this summer I will be working on a collaborative installation with Icelandic ceramics artist Ingibjörg Gudmundsdottir for the Brighton Digital Festival. The project is part of the Landscape : Islands series devised by Kay Aplin and Joseph Young. Lastly, you also might want to have a look at a video from my performance Lauschen at the Lewisham Art House in March, which can be accessed here. Documentation from the recent J.I.G performance is also now online. On 3rd May I‘ll be talking about Procedural Blending: a model of process in sound art practice at Goldsmiths University. It’s from 5-7pm in the Richard Hoggart Building, 8 Lewisham Way, London SE14 6NW. Entry is free. I am delighted to be playing again with JIG – consisting of Jude Cowan Montague, Georgina Brett and myself. It’s at Sonic Imperfections, The Montague Arms, Queens Road, Peckham SE15 on 10th May, 7pm. 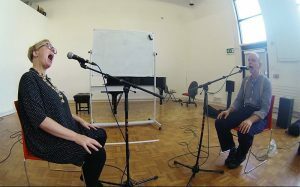 Jig combines electronic voice manipulations with spoken word poetry to produce an ever-changing surreal conversation, spanning music, comedy and even map reading. Fun! And, as a reminder, on 29th April Finnish label Tavern Eightieth will release an extract of my first ever duo with the excellent Poulomi Desai (modified sitar + electronics) at Salon des Refusés/Sonica FM. It’s on a double CD full of other superb artists (including AGF, Richard Sanderson), all in aid of Alzheimer’s UK, so do pre-order TVEI24 now! My paper From conceptual blending to procedural blending: applying a model of cognition to process in sound art practice has just been published as part of the OFF THE LIP: Transdisciplinary Approaches to Cognitive Innovation conference proceedings. Download the paper here. On 1st March you can catch me in conversation with Graham Dunning on his fabulous Fractal meat show on NTS Live. It’s at 1am in the morning, so if that’s a bit too early, you can listen to the archive later. It also contains loads of other interesting interviews and great music, so definitely wort spending a bit of time with! A few days later, on 4th March I’ll giving a seminar about sound arts process at the Bodleian Library for Digital Scholarship in Oxford. You can find out more and register here. Last but not least, here comes some of the creative stuff. An extract of my first ever duo with the excellent Poulomi Desai (modified sitar + electronics) from Salon des Refusés/Sonica FM last year will be released on the Finnish label Tavern Eightieth. The double CD is full of other superb artists and their music (including AGF, Richard Sanderson), all in aid of Alzheimer’s UK, so do pre-order TVEI24 now! 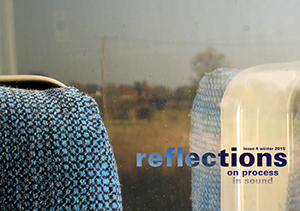 Just in time for the New Year, the fourth issue of Reflections on Process in Sound has been completed. In it, Chris Weaver considers the development of Variations for Rooms and a Tone during a collaborative residency with Fari Bradley in Dubai; SoundFjord‘s Helen Frosi and Stephan Barrett muse about their collaborative project Postcards from the Volcano; Melbourne based Catherine Clover gives us an example of her species-spanning listening practice; Salomé Voegelin and David Mollin explore their writing practice via the transcript of a talk for Nietzsche, Cyclists and Mushrooms in Switzerland; Magz Hall introduces Tree Radio, an out-door installation at Yorkshire Sculpture Park. You can find it at http://www.reflections-on-process-in-sound.net. To continue with reading matters, check out a very nice blog post about the CREAM workshop Art/Science: Observations on Commonalities of Process led by myself and Graham Klyne at the Jisc Research Data Spring gathering in December on the Digital Curation Centre blog here. You can find out about my and others’ 2016 New Music Predictions, and see a list of the top 100 releases of 2015 – with my album Breathing Through Wires on Pan y Rosas Discos coming in at number 4! My first concert of the year will take place on the 22nd January, with JIG at Club Integral, The Others, 6-8 Manor Road, London N16. Find the details here. 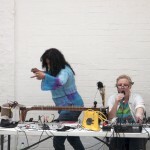 Or listen to an interview with JIG member Georgina Brett on Resonance FM, which also features some excerpts of recordings at https://www.mixcloud.com/Resonance/club-integral-radio-show-6th-january-2016. The next outing will be to the International Digital Curation Conference (IDCC) in Amsterdam, where I will participate in a joint CREAM paper Using metadata actively and workshop Metadata in action. The paper will be published at a later date. Before the year is out I managed to deal with a backlog of photographs. So, below are links to sets from the CRiSAP trip to Venice, including the symposium at the Venice University School of Architecture, the Biennale, eating pizza, staying in a convent, and travelling on canals. The second set is from a trip to Plymouth to the “OFF THE LIP: Transdisciplinary Approaches to Cognitive Innovation” conference, convened by CogNovo and the Plymouth University Cognition Institute last September. I am looking forward to playing a rare 8-channel concert at SOUNDkitchen‘s SONICpicnic event at Vivid Projects, Birmingham. It’ll be streamed via SonicaFM and should be up on the archive afterwards. Also playing are Justin Wiggan, another voice artist Girilal Baars and many others. More info is here. I am also very much looking forward to the CRiSAP outing to the IUAV University of Venice, School of Architecture, Venice, Italy, where I shall be be giving stalk about Sound and the Imagination in Urban Spaces at the Sound Passages: passaggi di suono Symposium. 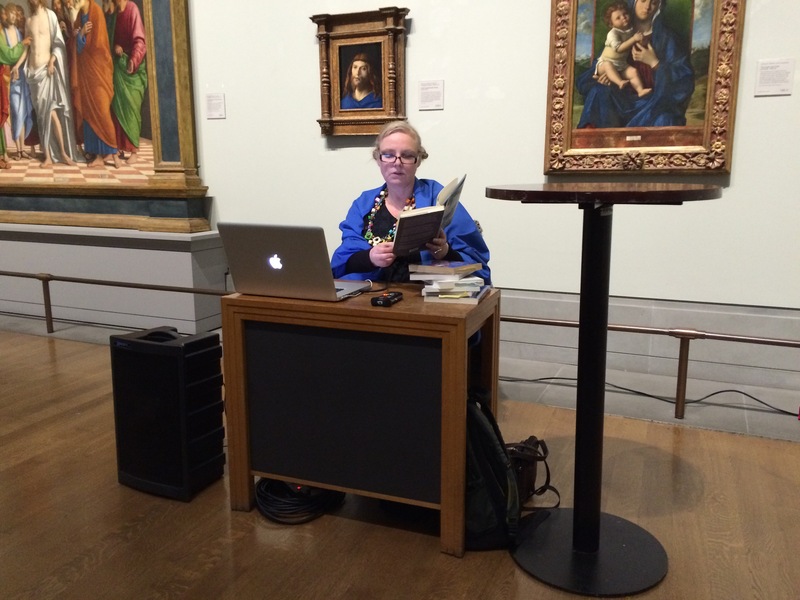 Here – finally – an extract from my performance/talk at the National Gallery‘s ‪‎Soundscapes‬ Late event in September. Thanks to John Kannenberg for the recordings and Lisa Hall for organising! 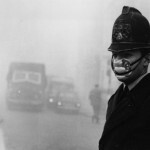 I am emerging from a week in bed to the good news that Getty Images are sponsoring FOG, the follow-on project to SMOKE. 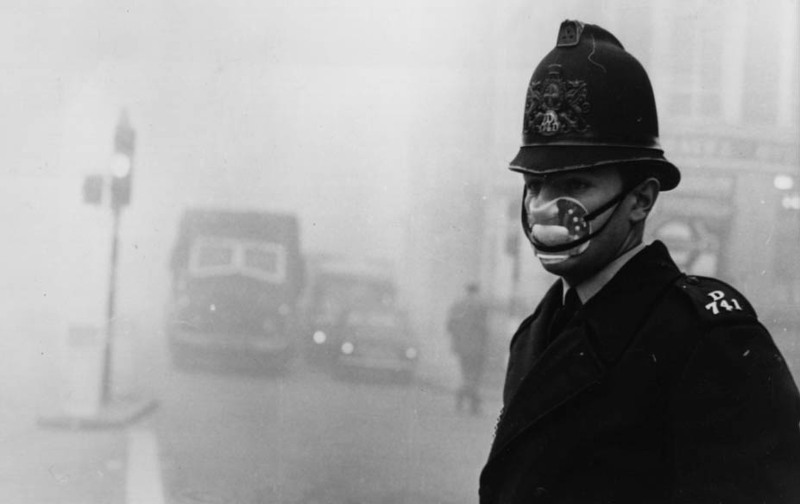 I will use images of London’s famous pea-soupers from their archive for a second audio-visual piece. Elsewhere, on 223rd of October one of my composition features in the Vox Novus Festival at Brookfield Place New York, 230 Vesey Street, New York, NY. 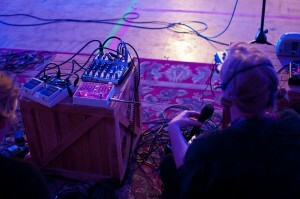 Earlier this year I was a judge on the JTTP competition, held by the Canadian Electroacoustic Community. Its winner Xavier Madore features in Akousma 12 on 8th October in Montreal, QC, Canada. On the same day I will be playing at EAVI XIII by Goldsmith’s Embodied AudioVisual Interaction Group in London, with Graham Dunning, Kim Kate, Rose Dagul, and plenty of others. See more here. Should you be interested in reading material, cheek my blog post Procedural Blending for Collaboration on the CREAM blog here. A very nice review of Meditations on Light by Simon Whetham , released on Monochrome Vision in 2011, includes an equally nice mention of my contribution, Lonesome Alien Rider. Read it here. I am also looking forward to another voice trio, taking place on 1st October with Jude Cowan Montague, Viv Corringham and myself at The Potting Shed vs Friends of Jude at Full Stop Cafe, Brick Lane, London 8-11pm. Earlier this month, I will travel to “OFF THE LIP: Transdisciplinary Approaches to Cognitive Innovation” convened by CogNovo and the Plymouth University Cognition Institute to give a paper “From conceptual blending to procedural blending: applying a model of cognition to process in sound art practice” has been accepted to the conference. It will be published In january. On 4th September I will create a performance-walk around the Soundscapes Exhibition at the National Gallery. 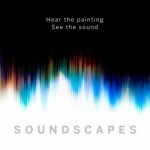 The performance is part of Soundscapes Late and essentially I will do realtime responses to several paintings. Below are some images of my new voice/electronics performance collaboration with the amazing Jude Cowan Montague and Georgina Brett at New River Studio. It was a great pleasure! I very much enjoyed the sound in that place and I’ll put a recording up shortly. Also, my first ever duo with the fab Poulomi Desai at SonicaFM’s 3-day sound art festival for Salon des Refusés was a great success! We really work well together! Lastly, I am delighted to announce that my research into process is continuing, as I will be applying my notion of procedural blending to the investigation of active metadata as part of the JISC funded cross-institutional research project CREAM. 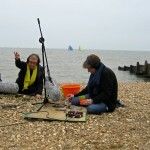 On 2 July, 9pm, My Radio Arts Dreamlands commission Morse Code Choir will receive another airing at http://www.phonic.fm. 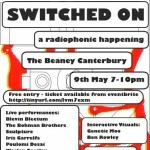 For the rest of the month it will be streamed via http://www.youarehear.co.uk/radioarts/iris-garrelfs. 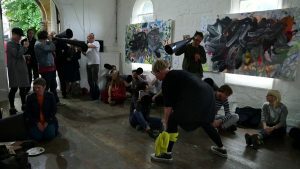 My paper “From conceptual blending to procedural blending: applying a model of cognition to process in sound art practice” has been accepted to the conference “OFF THE LIP: Transdisciplinary Approaches to Cognitive Innovation” convened by CogNovo and the Plymouth University Cognition Institute. I know, it’s a bit of a mouthful, but I’m expecting it to be a nourishing one! It will take place from 9-11 September in Plymouth. 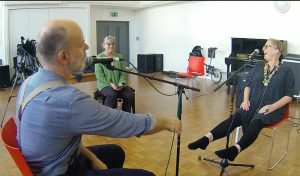 A little earlier, on 26 July a new vocal performance collaboration of mine with Jude Cowan Montague, Georgina Brett will have its premiere at New River Studios, 199 Eade Road, N4 1DN. 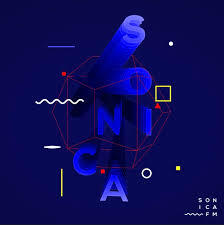 Streamed at sonica.fm. We are intending to develop it into a full-blown Orchestra of Voicea in due course! On Sunday 14th June at 2pm I’ll be playing my first duo with the fab Poulomi Desai, which I’m very much looking forward to! The concert takes place as part of SonicaFM’s 3-day sound art festival for Salon des Refusés in 129 – 131 Mare Street, E8 3RH. It will be streamed so if you can’t be there in person, listen online at SonicaFM’! All the details inludiung line-up can be found here. Cycling74’s Max Connect is in town and I’ll be giving a performance/lecture to demonstrate how I use the software in performance. Also on are Nick Rothwell, Leafcutter John and Ned Rush. It’ll all happen on Thursday 18th June from 7pm at Music Hackspace, E2 9DS. All the details are here. I’m very happy to making sounds again with Jude Cowan Montague . 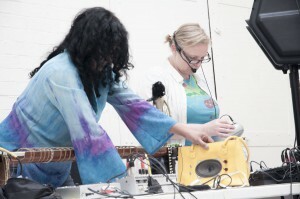 On 27th June at 2.30pm we’ll be creating the imaginary City of Irisjude live on Resonance FM for the hybrid news-arts programme The News Agents, a hybrid news-arts show Listen live or online via http://resonancefm.com. Also, for all your process-oriented folks, I have uploaded my thesis From inputs to outputs: an investigation of process in sound art practice here and the fourth issue of Reflections on Process in Sound is under way with an expected publication date later this summer. I’ll be performing a new version of my stargazing radio/performance piece (Talking) Space to Space at the The Beaney Museum in Canterbury. 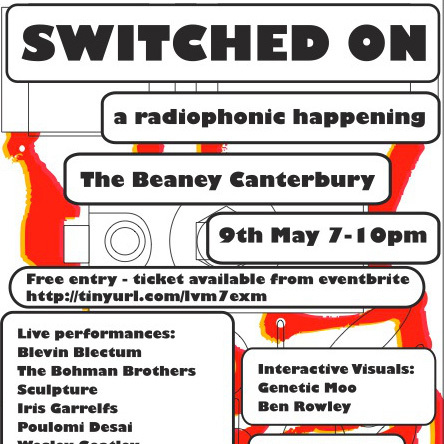 Free tickets for the Switched On event on the 9th May, which also features The Bohman Brothers, Blevin Blectum, Poulomi Desai and more, can be obtained from eventbrite. I’ve received a few great images from recent talks and performances. The photographs directly below are from Field Studies, taken by Joseph Kohlmaier. I was responding to notes and drawings from participants. The following pictures were taken at Sonic Imperfections, Telegraph Hill Festival, by Jay Alix @jayalixphoto. On April 1st I will give the keynote at this year’s fabulous Field Studies series at Musarc, London. Expect a mix of past projects and a short live performance. Very much looking forward to it! Also in April I’ll be part of a live voice, electronics and live visuals quartet featuring Blanca Regina, Sharon Gal and Nathan Jones. It’s at LimeWharf in London and will be broadcast at Sonica.FM. For more information click here. Delighted to say that my performance piece Unwitting Scores has made it into an amazing collection of works curated by Poulomi Usurp Desai for the Google Cultural Institute from material in the British Music Collection at Sound And Music on occasion of International Women’s Day. 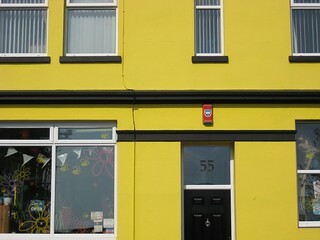 It also features works by the fab Magz Hall, Riz Maslen, Ain Bailey and many other amazing women! Find it here. 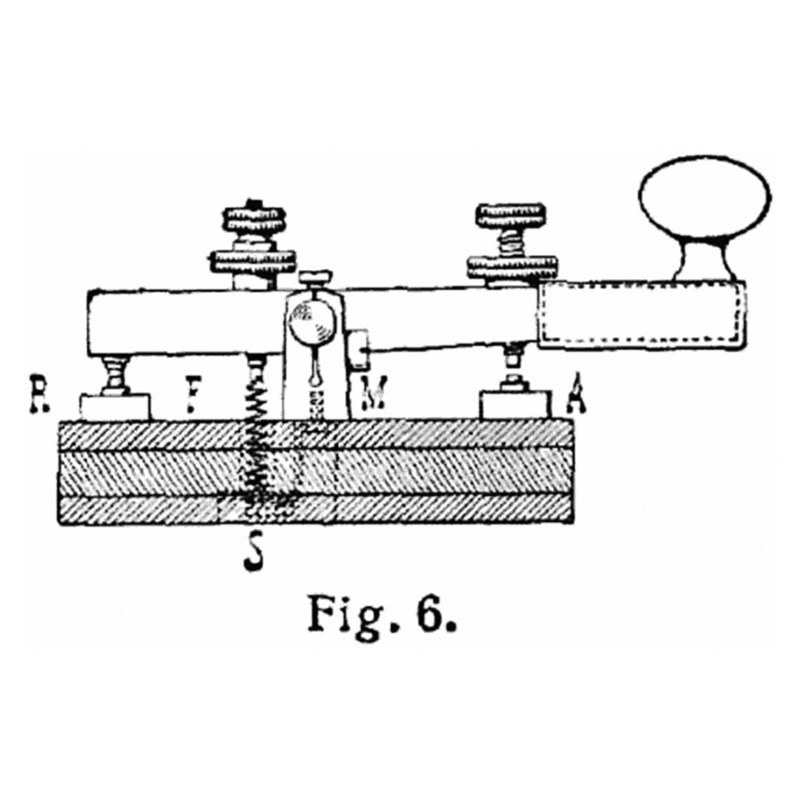 My Radio Arts commission Morse Code Choir, a composition made from historical events throughout the 20th century translated into sonified Morse Code can be heard on Resonance FM on 11th March, and for a month afterwards via youarehear. Garrelfs’ gymnastic flexibility is remarkable. Her falsetto has this incredible pinball elasticity, zipping suddenly upward in playful excitement or sudden shock, reaching pitches that seem to shrink her into miniature. 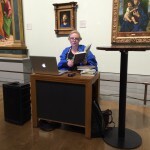 After a fabulous residency at Tate Britain, inviting stories and stories around the theme of listening into my Listening Room earlier this month have now finished putting some further documentation online, including a link to the radio broadcast featuring extracts from the conversations. You can find it all here. Jude Cowan Montague and myself have started a new venture, called The Potting Shed. It’s all about nurturing sounds and connections with a lighthearted approach to creating things on the hoof. 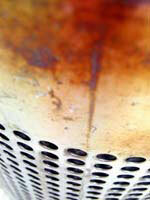 Our first event takes place on 21st Februatry at 100 Years Gallery, London with John Bisset, Rabbit and Cos Chapman. Find out more details here. Also a new concert has just come in: On Tuesday 17th March. 7.30pm I will be playing at Sonic Imperfections, Telegraph Hill Festival, St Catherine’s church, Pepys road, SE14. Also on the bill are Barrel, Bei Bei Wang and the Iyatra quartet. You can still listen to me in conversation with Sonic Imperfections curator Ian Faragher on Resonance FM. Lastly, on Thursday 26 March I will give a talk entitled Voice and Material at the ICA, London as part of Critical Waves, a collaborative project around research and radio. After my last album Bedroom Symphonies made it into a list of the best albums of 2014 on Future FM, my new release Breathing Through Wires is now out on the best net label of the year (according to CC Music), Chicago based PanY Rosas Discos. 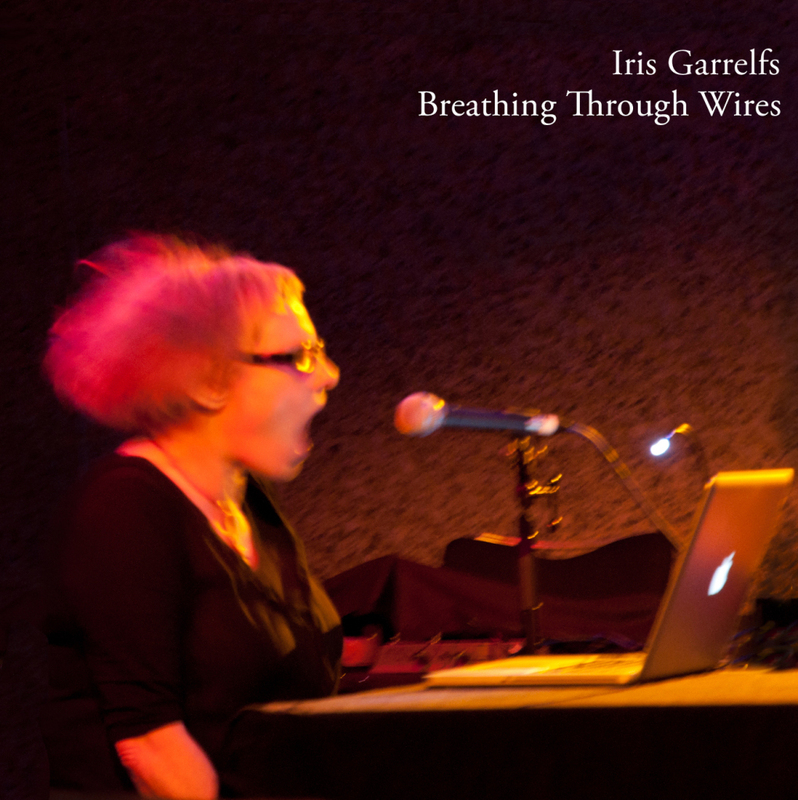 Breathing Through Wires features a selection of live improvised and processed voice performances, recorded in the UK between 2012 and 2014. Expect to hear a wide range of sounds and sonic modalities, from aggressive screams to delicate melodies, intricate rhythms to machine noises all constructed from and through live voice in an act of listening. Listen for free here. For all my New York based friends:, my sound work Sofa Surfing USA will feature as part of Circuit Bridges at Gallery MC in NYC on January 29. Find the details here.